Oils have slowly become my favorite medium. They scare the heck out of me, but as far as traditional media, gotta love this stuff. 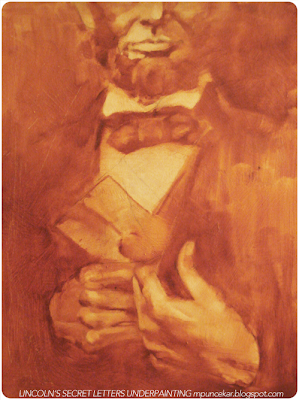 The process, especially the underpainting is so much fun. I like to just throw down my base color and just straight to picking up instead of painting really, just wrapping a paper towel or rag around my finger and using that. Adult finger painting if you will. Today, on top of the finger painting, the freakishly talented C.F. Payne (if you aren't from CCAD google him, then be super jealous of me (seriously.)) suggested simply that I use a fan brush to soften some edges. For whatever reason I never tried it. It had such a great impact and ease of use... I think I owe him somehow even though I am paying outrageous amounts of cash to take his class in the first place. Because it helped a stupid amount. Just did this today in class. Struggled a bit with the hand positioning and pose for a long while before settling on this particular composition (Yea, the thumb is a bit stinky). So far it's 20 something inches tall and in oils. Final color scheme is going to be blue with grey skin tone with redish purple fleshtone hot spots. Like subtle purple on the nose, lips and fingertips. A very cool color toned image image. In the end it will be a book cover with the text running right across the chest. Really want to do hand drawn text, but I'm a big chicken. A big, can't draw type, chicken. Again, I'll be posting a sketch dump soon, so I'm going to leave this post without a sketch-a-day. Sorry to those who are following my sporadic updates. And also thanks to anyone checking in, it's very much appreciated and makes me keep pushing a bit harder, because I really don't want to post junk and lose you few valued people. what about if you copy your finished piece than draw the text on the copy. Well, If I do it, I'll be putting the text on using photoshop layers and doing the lettering on a seperate piece of bristol, but for being an illustrator in training of sorts, I can't draw letters to save my life. But we will see how it goes once the painting is closer to completion haha. I'll definitely be getting a nice scan of this off of my school's large bed scanners once it's dry. I worked on it this morning, but the beginning glaze didn't want to cooperate all that much, and it's still a bit too purple. Hopefully tommorrow's try will be more successful.